In our last post, we highlighted our variety of roofing services that we offer here at Go2 Contracting, in addition to shining the spotlight on our hail and storm repair services, our gutter services, and the external siding options we have on offer. We encourage you to take a look at that post if you’d like a brief rundown of each of our services. But there is more to our El Paso County roofing company than simply providing roofing services for an agreed-upon price. Sure, that’s a key part of it of course, but we want our readers and prospective customers to understand that we set ourselves apart from the competition in a few different ways. Among those ways is our passion for providing world-class customer service. We are a part of the communities in which live and work here in along the Colorado Front Range, and to that end we feel like your neighbors when we complete a roofing job. While every roofing contractor under the sun is going to tell you that they care about customer service (because most do, of course, on some level), we make it a hallmark of our organization. We want to be known by it — and here’s the kicker — we are! That’s why in today’s post we are going to take the opportunity to let our satisfied customers do a little marketing on our behalf. But before we get to the meat and potatoes of highlighting a few of our favorite customer reviews, allow us to say just a few words about why reviews matter so much to our Colorado Springs roofing company. The past five years or so has caused us to see a massive change in the way we think about doing business, what with the introduction of online reviews being a major way that people make decisions about choosing their roofing company. Obviously, this change extends beyond our own company and industry — there are very few organizations out there who aren’t concerned with their digital reputation in some capacity. While word-of-mouth recommendations ruled as king for as long as there has been society itself (we won’t be going down that rabbit hole, don’t worry), more and more people have stopped asking their neighbors, friends, or family for their input since all that it takes is a couple clicks to find someone’s online review profile — complete with customer’s detailed perspectives and star-ratings! And in this fast-paced world we live in, people are more occupied than perhaps ever before. There are so many distractions, so many things to fill our time with, that it’s tough to find five minutes for yourself. So when we receive positive reviews (and even the odd review with some constructive feedback), it means a lot to us. People have taken precious time out of their day to let us and others know that “this is a solid roofing contractor.” When there’s a trend of folks who not only pay us their hard-earned tender for roofing services, but go above and beyond to give us a great review, it means a lot to us! That’s why we are taking the time to share some Go2 Contracting review in today’s post. Read on to hear from folks who were once in your very same position — trying to find an El Paso County roofing contractor worth their salt! Though our roofing company is Go2 Contracting in name, folks often call us “Tuff Roof,” as it is the top-line roofing system we offer. The Tuff Roof System includes an ice and water guard, metal valleys, rain-buster caulk, and much more. For more information on the Tuff Roof System, visit our roofing systems resource. Mrs. Ray, we are thrilled you took the time to let us and others know about your experience working with us. We are even more pleased that we could assist you by working with your insurance company to get a brand new roof worth close to $10,000! That goes to show the level of commitment we are willing to put forth when advocating for our clients. Thanks again, Mrs. Ray! We like this review because of its directness. You want a roofing contractor in Colorado Springs (and beyond) to be quick, clean, efficient, and reliable. We do our best to be communicative, punctual, and respectful when we are working on your property as well! Thanks Bertram, for your business and your kind words! We take the time to make sure our customers understand each aspect of the roof replacement, repair, or whatever the job might entail. We aren’t in the business of glossing over details for the sake of saving time. We are in the business of making sure our customers feel confident about the work they receive. Thanks, mysterious and happy customer! CR, we are happy to provide a free roof inspection for you. With the amount of hail and high-wind storms we experience in Douglas County, El Paso County, Arapahoe County, and, really, up and down the Front Range, it’s better to be safe than sorry. If CR had needed roofing work to be done, we are the company to go to — we’ll help assess the pros and cons of going with a roof repair over and installation, and vice versa. The final review we’d like to highlight today comes from Byron. Byron, this is the kind of review that makes us excited to wake up in the morning and continue doing what we love. We do our best to leave any job site just the way we found it. What’s more, we love this review because it shows that we are efficient and prompt even when there are multiple homes that need roof repairs from hail damage, as was the case here. Thanks again, Byron! 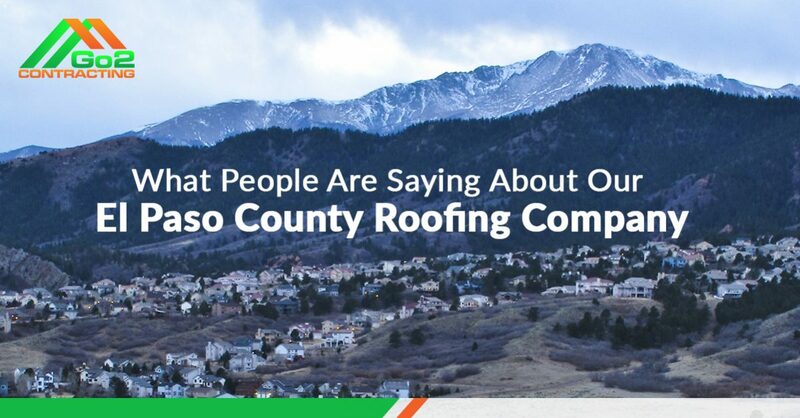 Go2 Contracting is your El Paso County roofing contractor of choice — and you don’t have to just take our word for it either. Get your free quote for a competitive estimate, high-quality materials, and experienced industry leaders.